The Palm Springs International Film Festival opens this week with hundreds of filmgoers, movie makers, directors, actors and celebrities expected to attend the annual gala on Saturday, Jan. 7 and more than 100 films during the 11 day festival. The Palm Springs International Film Festival takes place Jan 5-16. Visit www.psfilmfest.org for tickets, information or to search for movies and screening times. Besides the incredible array of films, galas and parties, one of the non-film highlights is an exhibition of Marilyn Monroe photographs that will be on display in stores and restaurants throughout Palm Springs Uptown Design District all during the festival. The show is based on a new book about the actress, Marilyn: Intimate Exposures, and chock full of photos by Bruno Bernard, her friend and confidante, the famous Bernard of Hollywood who is credited with “discovering” Marilyn. Bernard has been called the “Rembrandt of photography” and the “king of glamour” who made his name taking portraits of female stars and starlets of the 1950s such as Anita Ekberg, Jayne Mansfield, Brigitte Bardot, and Monroe. He also photographed many male luminaries such as John Wayne, Gregory Peck, and Elvis Presley. Bernard fled Nazi Germany in the 1930s, eventually migrated to California where he studied film and photography. He established himself in Hollywood becoming one of the most sought-after celebrity photographers. Countless hopeful stars visited his Sunset Boulevard studio to have their portraits taken. While she was still called Norma Jeane, the young model first met Bernard in 1946. One story says they met passing one another while Bernard was leaving a dentist appointment apparently near his studio. As did many Hollywood hopefuls, Norma Jeane stared up at the “Bernard of Hollywood” sign and asked if he thought she could be a model. Bernard’s now famous photos captured the transformation of Norma Jeane, then a 19-year-old girl-next-door, into the glamorous movie star, Marilyn Monroe. With additional studios in Palm Springs, Laguna Beach and Las Vegas, Bernard immortalized some of the century’s greatest stars and mastered the art of pin-up photography. An icon of the 1950s and 60s, Monroe was often in Palm Springs between films and owned a home in the Las Palmas area from 1960-61. The Monroe photo exhibition in Palm Springs Design District shops and restaurants is a perfect place to connect with Mid-Century Modern design and decor. 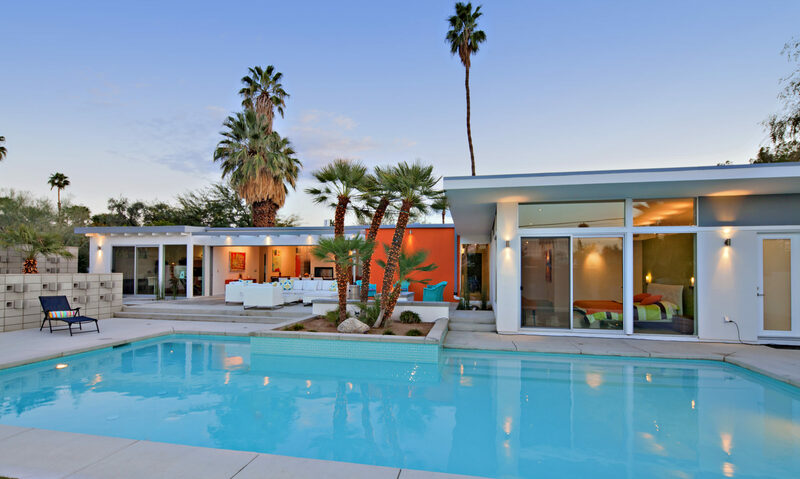 After attending the Palm Springs International Film Festival and the retro photo exhibition, satisfy your passion for Modernism and take a tour of Mid Century Modern homes and estates for sale in the Palm Springs area. Many are located in historic districts and significant neighborhoods near Marilyn Monroe’s former Las Palmas home.